Data center managers everywhere are being pushed to improve energy efficiency. But traditional approaches to power monitoring fall short because they fail to provide information about how much actual power devices are drawing, and whether cooling resources are being used efficiently. The following are the top three ways to improve data center power monitoring, improve energy efficiency, and effectively utilize cooling resources. Many data centers feed power directly from panels to blade servers. Although effective in distributing power, this approach is limiting in so much as it fails to provide information about the amount being drawn by the device(s). Intelligent rack power distribution units (PDUs) are an effective way to poll devices at the rack and determine exactly how much power is being drawn. They offer real-time remote power monitoring of current (amps), voltage, power (kVA, kW) and energy consumption (kWh) with +/- 1% billing-grade accuracy down to the individual outlet-level. Data centers have a tendency to overcool their facilities by several degrees just to err on the side of caution. But take note -- Gartner has determined that environmental sensors can save you up to four percent in energy costs for every degree of upward change in the baseline temperature. This is because temperature sensors at the rack inlet provide far more accurate, real-time view of data center temperatures compared to CRAC readings alone. This information can be used to make the cooling system more efficient, i.e. shutdown CRAC units as needed. 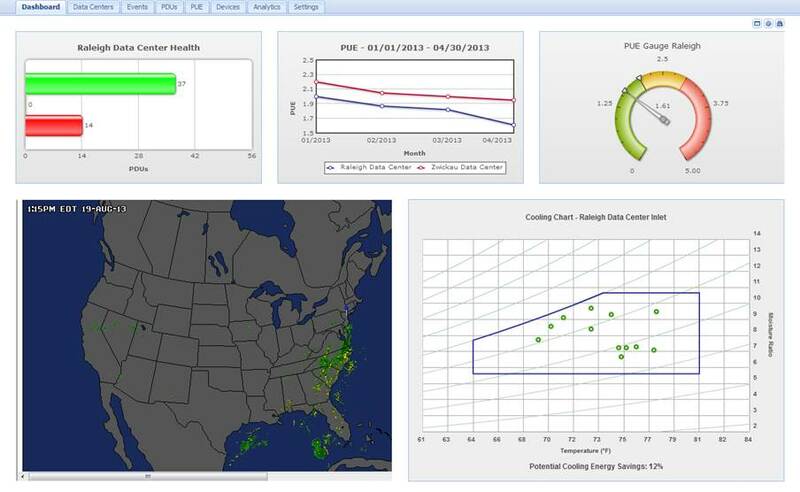 These days DCIM power monitoring software isn’t just a nice-to-have; it’s a must. That’s because power monitoring software provides real-time power analytics and energy trends over time, allowing you to find stranded capacity in the form of underutilized servers. When used alongside environmental sensors, DCIM power monitoring allows you to monitor temperature in real-time and calculates potential energy savings. It also helps ensure that you are meeting guidelines for temperature set points while reducing operational costs, and improving your power usage effectiveness (PUE). To learn more ways to improve data center power monitoring and lower your energy costs, download a trial of Sunbird’s DCIM power monitoring software, read how Cisco saved $9M on energy costs, or schedule a call with a Sunbird expert today.